Big Beanie's Castle is the last level of World 1 found in Yoshi's New Island. Yoshi starts the level in a castle with some enemies nearby, along with some number platforms and a key. 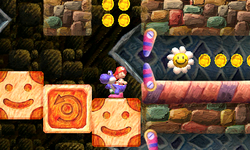 After traversing some more number platforms and flippers, Yoshi reaches a door which leads to the Checkpoint Ring and some blocks with smiley faces which rotate in a set direction. Some smaller blocks occasionally need to be pressed to make the smiley blocks to move. Eventually, the player reaches the boss door where Big Beanie awaits. Kamek enlarges him with his hammer and Big Beanie grows into a beanstalk with himself at the end. When the player hits Big Beanie three times with eggs, the next level can be accessed.